The Twelve Planets will spread over 2011 and 2012, with six books released between February and November each year. The first three titles will be Nightsiders by Sue Isle (March), Love and Romanpunk by Tansy Rayner Roberts (May) and the third collection will be by Lucy Sussex (July). More information relating to upgrades, ebooks and distribution will be made available in due course. 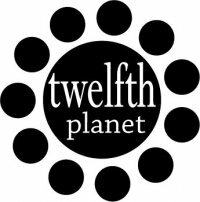 Please visit the Twelfth Planet Press website for more details. In other news, two short stories of mine have garnered brief but satisfying mentions in reviews this month. “She Said” by Kirstyn McDermott is another standout, an almost painfully personal sketch of an artist, Josh, and his girlfriend, Mallory. There are strong surrealistic touches in this story, but unlike other, more bizarre tales, “She Said” is held together with well-realised characters and an internally consistent world. As McDermott says in her afterword, this story is about “masochistic muses”. There is a thread of need pervading this story, and that neediness feels dirty, both for the characters and the reader. Darkness doesn’t get much more personal than this. Kirstyn McDermott’s story of Melbourne goths and a nasty little secret, “Monsters Among Us”, has the virtue of sounding like the author had eavesdropped on a real group of people. The dialogue has an exciting verisimiltude that is sometimes lacking in dark fiction. And that’s probably more than enough preening for one day! Back to the bunker, McDermott.